Mount Christoffel Hike - A Caribbean Challenge! Mount Christoffel is the highest point on the island of Curacao and the stand-out feature of the beautiful Christoffel National Park. Anyone wanting to experience the best hiking in Curacao should take on the challenging but rewarding Mount Christoffel hike - we did, and here 's our story!. Our family group (my son, daughter, daughter's boyfriend and me) left in the early morning, our destination - the Christoffel National Park, and the beautiful Mount Christoffel! Google told us to expect a 30-minute drive - easy peasy! Confident of a straightforward trip ahead, we turned on maps.me and followed the directions it offered. Sure enough, the drive was smooth, until the system told us to take a left. For the few minites we follwed a good read, but this shortly changed into a dirt read. Still, no major problems so far. After 15 minutes, we encountered the first small elevation (which we overcame fairly easily), but then we faced a steeper incline, strewn with small boulders. Luckily we had an excellent chauffeur! Soon, the quality of the dirt road became atrocious. Small boulders changed into bigger boulders, and after 30 minutes driving, we found ourselves at the bottom of a steep hill. Our poor rental car (a Kia Picante) did its very best, but there were too many boulders, and the path ahead was just too steep ....... There was nothing for it, my daughter's boyfriend turned the car around and drove back the way we'd come! With the help of a friendly local person, we found the Christoffel National Park - just in time to climb the mountain before it became too warm. Note: Since we made our journey. Maps.me updated their maps - and they no longer direct drivers along the dirt road! There's a small fee for admission to te Christoffel National Park, and we paid at the office, accepting a map from the friendly attendant who served us at the front desk. We drove into the mountain side of the Christoffel National Park, and made the 5-minute journey to the base of Christoffel Mountain itself, leaving our poor little car in the convenient parking lot! It may have taken us a lot more then half an hour, but we'd reached our destination, and we were finally ready to begin hiking up Mount Christoffel. We grabbed our backpacks (full with supplies like water and snacks), and started climbing the trail. The first part was nice and easy, with a broad path that ran gently uphill. As this picture shows, the guys kept striding out ahead of us, and us girls soon started to work up a sweat trying to keep up! While hiking Mount Christoffel, you're sure to see a range of beautiful plants. The mountain is home to various cacti and Prosopis juliflora. Most stunning of all is the Bromelia humilis. Soon, the trail became steeper, with a lot of boulders ranging from small to large. I'll be honest, us girls were huffing and puffing by this stage, while the guys were far ahead! We took a break for water and a quick snack, to fuel ourselves with energy for the climb to the top. We made it ...... The top of Mount Christoffel Mountain! The view was amazing, with a beautiful panorama in every direction. There's often a cooling breeze at the summit, which is welcome after the climb. We sat down to enjoy the moment. It was time to say goodbye and start going down. The way down was almost as challenging as the trail to the top, and we all had to concentrate hard on where we put our feet, to avoid slipping. We took our time and made it all the way down without getting any scratches! We rested at one of the picnic tables the park offers and start eating our sandwiches. This colorful bird was not shy at all. He/she is called Warawara, and was confident enough to sit at the picnic table like one of the family, and pick small pieces of the bread we offered! 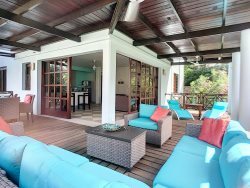 Keen for some rest and relaxation , we left Christoffel National Park and headed to the beach at Blue Bay Golf & Beach Resort for the rest of the afternoon. 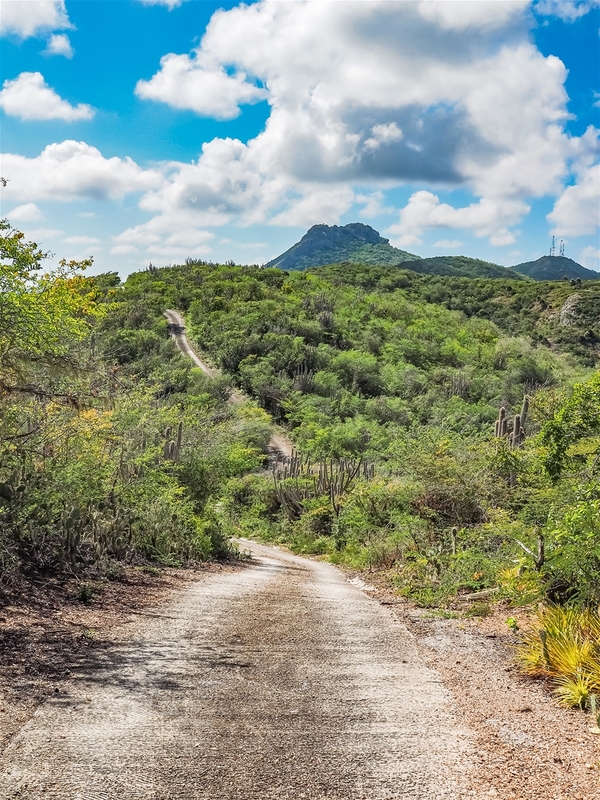 Hiking up Mount Christoffel is a must-do-activity for anyone fit and able bodied who's visiting Curacao. The total elevation of the mountain is 1227 ft (375 m). It's not the world's most demanding hike, but it is definitely has its challenges - like large boulders, and the narrowness of the trail (which is only 2 ft wide in some places). Our Advice: Head out before the heat of midday, well equipped with plenty of food and water. And remember, whatever the challenges, the views from the summit makes it all worthwhile!